And for someone who just wants life to return to “the way it was,” this can be difficult to accept. But in some cases, people have not only been able to bounce back following trauma, they’ve also been able to experience growth. 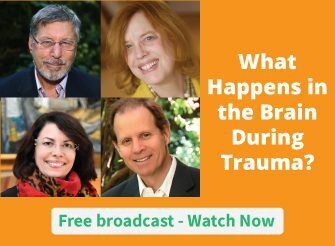 In the video below, researcher and author Sonja Lyubomirsky, PhD offers her insights into what contributes to post-traumatic growth. How will you use these ideas in your work? Please leave us your thoughts in the comment box right below. Thank you for the contrast perspectives with regards to the holocaust survivors. As I have chosen to move through my own trauma, I too faced the guilt of choosing to find joy in life and was able to resolve it by acknowledging that if something better doesn’t come from our experiences, what is the use of living? I now, use my own experience to assist my clients in coming to terms with the choice that lies ahead for them in what they can receive from this experience that will allow them to grow from the experience in ways they never imagined possible if they are willing. While there are those who are able to reach the Post Traumatic Growth by themselves or learning from the experience in a positive manner, there are those who remain in the state of Post Trauma. if they have to understand their potential for Post Traumatic growth,It is important to guide the client to revisit the traumatic experience, after they are able to handle it better, to SEE what they did during the situation and in the course of the recovery and resolution. This helps in the client actually see themselves not just as ‘Victims’ but as someone who was ‘Able To’ deal with the situation. The latent strengths that were till then not noticed, get actually acknowledged by the client himself or herself who till then was unaware of those strengths. My own personal experience of traumas have taken me through phases of propulsion and stagnation. What I have time and again noticed personally, professionally and even Socially is that human beings have the tendency to nurture the wounds not working towards healing whenever the environment allows this luxury.